At the start of the next episode, the other guy says, who’s going to kill me, and how long do I have? So the gypsy sits down, squints at the guy’s hand, throws a few chicken bones, looks at her wristwatch, and announces: two days from now, a woman is going to kill you with a knife. And now you’ve got a pre-emptive murder mystery with a ticking clock, which means storylines for everyone. Hooray! I swear, the confidence of these first few weeks in 1897 is just breathtaking. They’ve set up this crazy llittle time travel drawing room comedy of the living dead, and now they’re just sprinting through the plot points. Because “two days” on a soap opera doesn’t mean two days in story time. Who the hell bothers to keep track of story time? They mean two episodes from now, i.e., Monday. If they talk about it for too long, it could be a whole day before they even get up from the table. It’s happened before. I saw a soap opera once where a guy asked a woman to marry him, and it took three days for them just to finish the conversation. She said no. Now we’re going to head downstairs, where the crazy lady hidden in the attic has become the crazy lady hidden in the basement. Jenny is one of those picturesque all-purpose television lunatics who jump back and forth between absent-minded dreaminess, anxious confusion and furious white-hot rage, which is interesting to watch and takes up a great deal of screen time. Every time she speaks, she has to cycle through the whole assortment, and then somebody feeds her a straight line, and she goes through it all over again. So it’s no wonder that actors like playing roles like this, because it’s like having three different parts, and you don’t even have to pay that much attention to the other person in the scene. Meanwhile, the bleak palm reading takes a break for a musical number. 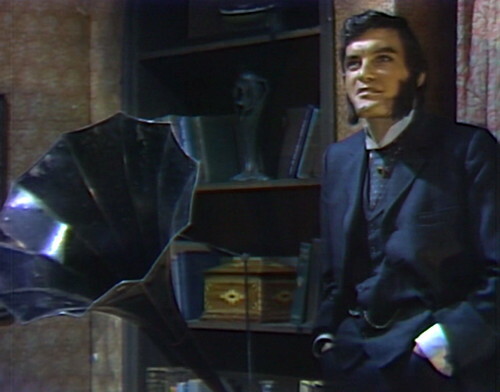 For no particular in-universe reason, Quentin suddenly gets to his feet, turns on his gramophone, and looks wistful. “I read somewhere where every person has a theme of music,” he says. “Well, this is mine.” This is not a particularly plausible theory. Who would monitor that system? I mean, there’s got to be six million people in Kentucky, and there are only so many Creedence Clearwater songs. He’s a record producer named Charles Randolph Grean, and in 1967, his teenage daughter introduced him to Star Trek, which at that time was finishing its first season. Inspired, Grean produced an album called Leonard Nimoy Presents Mr. Spock’s Music from Outer Space. 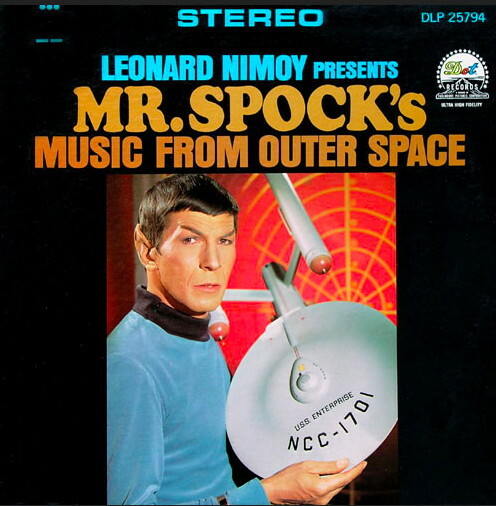 The album begins with a groovy up-tempo version of the Star Trek theme, and it ends with a four-minute rant written by Grean called “A Visit to a Sad Planet,” where Mr. Spock explores a planet that was destroyed in a nuclear holocaust because they forgot how to love each other, and when Spock asks what that planet was called, the answer is… Earth! So I assume that’s canon. 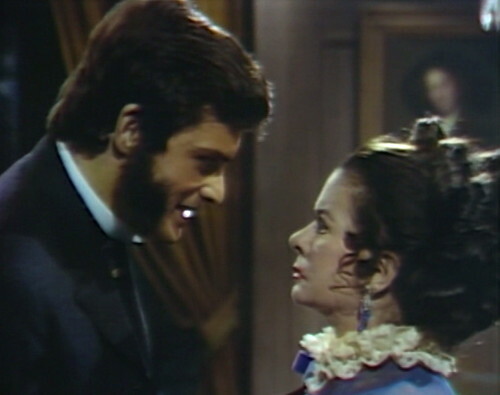 Next, as the story goes, Grean’s daughter told him about Dark Shadows, which gave him another great idea. It’s a good thing that girl watched a lot of genre TV, because she was single-handedly keeping the household solvent. Grean heard the little ghost-story tune they were playing on the gramophone, and decided to make that his next sensation. Recording as The Charles Randolph Grean Sounde, he produced a “Quentin’s Theme” single, which was backed with a cover of another Dark Shadows background theme, “#1 at the Blue Whale”. I’m not exactly sure when the single was released, because the internet has failed me, but it’s somewhere in spring 1969, and by summertime it’s going to chart on the Billboard Hot 100. We’ll be hearing more from Mr. Grean later on in the year. Anyway, Jenny can hear the music all the way down in the basement, and she gets a bit agitated about it. They must have a Bose speaker down there or something, because my understanding of 19th century gramophone technology is that you could sort of hear the music playing if you were in the same room with it. Hearing this song makes her go completely mental, so it looks like it’s going to be a long summer for her. She screams, “He’s back!” and then starts babbling about how “he needs to be punished.” By the end of the episode, she’s going to bust out of the cellar and start prowling around the house, because she’s actually some kind of metaphor about dark secrets that you thought were safely hidden and controlled. It might turn out to be a long summer for everybody. Okay, back upstairs to the faculty meeting. Quentin needs more intel on his upcoming murder, so Magda pulls a crystal ball out of the huge traveling bag that she apparently carries everywhere in case of sudden premonitions. She establishes the timeline, but the murderer’s identity remains frustratlingly elusive. All she can say is that it’s a woman whose name begins with the letter J, and that leaves the field pretty open. It’s 1969, so I’m thinking either Julia Child, Jackie Kennedy, Joni Mitchell, Joan Didion, June Lockhart, Joey Heatherton, Jane Fonda, Judy Garland, Joan Baez, Julie Andrews, Janis Joplin or Jefferson Airplane, although admittedly that last one is kind of a long shot. Rejecting all of those potential suspects, Quentin goes downstairs to confront his sister Judith, who is thirty years older, about three feet shorter, and doesn’t even know where the kitchen is, so how she’s going to come after him with a knife is hard to figure. But if she is the one, then Quentin is being reckless again, going straight up and asking her if she’s ever considered how beneficial murdering him might be as a long-term financial strategy. He gets all the way up in her face, and it’s possible that this is going to be one of those self-fulfilling prophecy deals that mythological heroes are always finding themselves enmeshed in. But that’s the point, really. It’s only been four weeks since Quentin Collins came into our lives in any kind of a substantial way, but already he’s become an epic figure. His legacy stretches forward through the centuries. He’s the object of prophecies and portents. He’s impulsive, and will almost certainly bring on his own destruction. He’s even got his own theme song. Yeah, Quentin is basically a Greek tragedy waiting to happen, and those kinds of situations usually get messy. Somebody ought to keep an eye on the cutlery, just in case. There are actually several shows that have the word “Gypsies” in the title, including American Gypsies, Junk Gypsies, Gypsy Sisters and Big Fat Gypsy Weddings. These don’t count, because they’re basic-cable reality shows, and if you’ve ever watched any of them, then it is war between you and me. In act 1, when Magda and Quentin sit down, the boom mic can be seen overhead. In her first scene, Jenny hangs onto the wall for a moment, until Judith tells her that her babies are awake. Jenny turns anxiously, and the wall that she was touching wobbles. Someone in the studio coughs several times during Judith and Dirk’s scene in the foyer. Dirk has a lot of trouble putting on his jacket in his scene in the foyer; he’s still struggling with it as he exits. 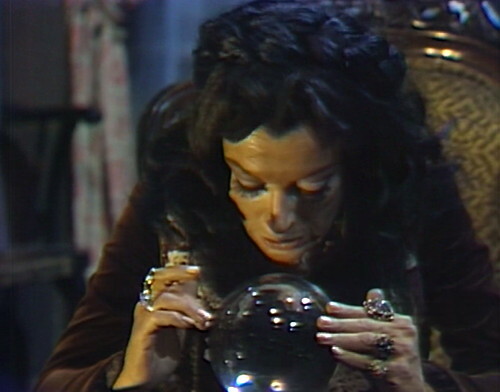 Magda has the sniffles today — she sniffs once when she’s looking in the crystal ball, and again as she curtsies to Judith and leaves. Also, not necessarily a blooper, but probably an anachronism: Quentin waves some paper money under Magda’s nose. I’m not sure what it is, but it’s definitely not current US bills. In the 1890s, money was mostly in the form of coins. Paper money had been introduced, but it wasn’t widely used. Even though I never got too familiar with the later seasons, I know that CHICO AND THE MAN at one point had a comical gypsy played by Avery Schreiber. Like a lot of modern ones (from what I understand), he went around in a trailer instead of a wagon. The comment about the speakers reminds me of one of my pet peeves in “period” stories (and others, but especially period ones), music that’s supposedly playing on some little machine, that somehow starts blasting over the whole scene. With a horn that huge, Quentin’s player would have put out some impressive sound, I’m guessing. However, based on my limited knowledge of cylinder players, something like Quentin’s player would be more like 1905 than 1897. And “gramophone” is a DS writers’ goof–cylinder players were called phonographs. YouTube features some pretty loud cylinder players from the early 1900s, but I don’t know if anything was pumping out the decibels in 1897. Cylinders had impressive dynamic range, owing to their up and down grooves. In general, they sounded considerably better than discs. Since they obviously weren’t using an actual cylinder recording, they must have gotten the pinched, tinny sound via equalization. Take a 10-band EQ, knock out the bass and overemphasize the mid-range. instant fake-cylinder audio. I used to own a 1929 His Master’s Voice gramophone (with a huge internal horn), and it was deafeningly loud! I stuffed old t-shirts into the front to mute it. Electrically recorded 78s played on my HMV could be heard across the street. Ah, yes, I whiled away many an hour back in the day, dreaming of Quentin’s huge horn and how impressive it must have . . . sounded? Seriously, tho – thanks for sharing the info re. cylinder players, dynamic range, phonograph vs. gramophone and your 1929 HMV. This is a top-notch blog, and the comments are often just as interesting and informative as Danny’s posts. & that’s saying something! True story about how elastic time is on the soaps: On “Days of Our Lives” in the 1970s, Julie was once pregnant for 14 months of our time. She gave birth – to a premature baby. It died. 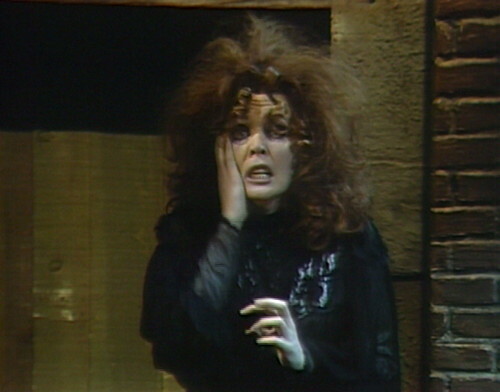 Marie Wallace scared me in 1969 and she still scares me. I had Quentin’s theme on a 45 record and about wore it out – I wonder where it got off to. Probably ended up in the trash with my Meet the Monkees album and my Troll dolls. I wish I had all that stuff back. I think that Romani (gypsy) culture is very interesting, and I am NOT talking about the TLC ‘reality’ shows. Love the idea of incorporating Romani characters into DS. It would have been fun hear Magda and Sandor throw around words like ‘gadjo’ (non-Romani person) or ‘marine’ (unclean).